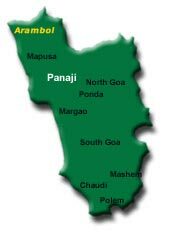 Arambol a small remote fishing village in Goa, lies 50kms from Panaji. The place has two beaches, more popular is the main beach (Harmal beach), the northernmost beach in Goa with clean sand, some bays and fresh water pools good for swimming. 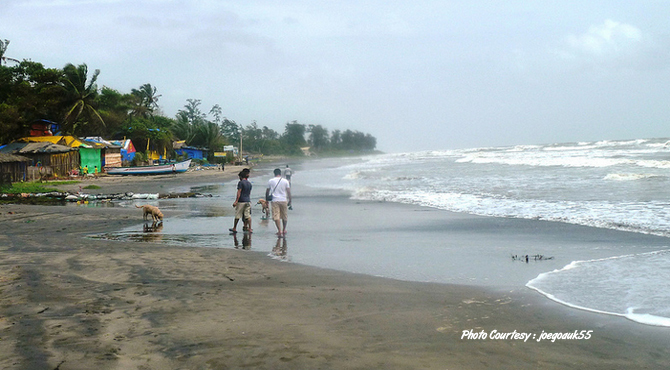 The beach is beautiful and the village is quiet and friendly, with just a few hundred locals mostly fishing people. The rocky headland or the cliffs near the beaches are popular for paragliding. The second, more picturesque beach lies beyond the rocky headband and can only be reached on foot and is bordered by steep cliffs on both sides. Arambol is popular as the best gliding site in Goa. Other sites include Anjuna, Vagator etc. Arambol is best for beginners with its regular, smooth and steady sea breeze perfect for easy, no break flying. The site has ridges which are flyable in North-Westerly winds as well as South Westerly winds. The winds set in by late morning right through the flying season from October to June and some days its possible to fly all day- at least 5-6 hours till sunset. There are three take off sites depending on the wind direction- 'Om' rock face is flyable in the South West direction, Kerry take off and the 1km long ridge to the right of the sweet water lake is flyable in the West to North West winds. The ridge is about 100 ft high and is normally used by beginners for top to bottom (TTB) flights and landings are usually on the beach in front of the lake. The problem with beach landing is the accumulation of sand inside the glider which tends to reduce glider life and make it difficult to pack the glider. Because of the strong, steady wind in Arambol, reverse launches are preferable and pilots should have the necessary ground handling skills for successful inflation and takeoff. Top landing is also possible from the site and tree landings are common. Check out the top landing area before itself and watch out for large rocks. There are facilities available for training and tandem (accompanied flights at about Rs.3000/flight ) rides using imported paragliders, from Arambol. Equipment also available on hire for qualified tourists from the Relax Inn on the beach.